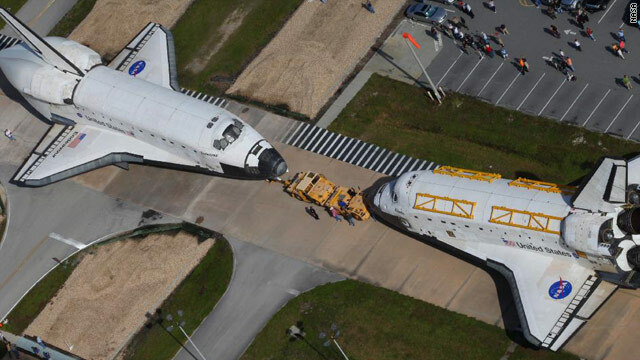 "NASA's space shuttles Endeavour and Atlantis switched locations today at Kennedy Space Center in Florida, and in the process came "nose-to-nose" for the last time in front of Orbiter Processing Facility 3. Endeavour was moved from Orbiter Processing Facility 2 to the Vehicle Assembly Building where it will be housed temporarily until its targeted departure from Kennedy atop the Shuttle Carrier Aircraft in mid-September. After a stop at the Los Angeles International Airport, Endeavour will move in mid-October to the California Science Center for permanent public display. Now in the processing facility after leaving the Vehicle Assembly Building, shuttle Atlantis will undergo preparations for its move to the Kennedy Space Center Visitor Complex in November, with a grand opening planned for July 2013." Why not use the space shuttle as an orbiter around the moon?